When it comes to our babies, finding good skincare products may be a difficult task. All of my children had sensitive skin as babies. I tried body lotions and diaper creams from multiple companies, but was never quite satisfied with the outcome. So, when baby number four arrived, I settled for the brands that were okay for me in the past, but my baby still had dry skin issues. I was grateful when Evoli sent me the Welcome Newborn Set to review. It gave me a chance to try new skincare products that were clinically proven and safe for my baby. 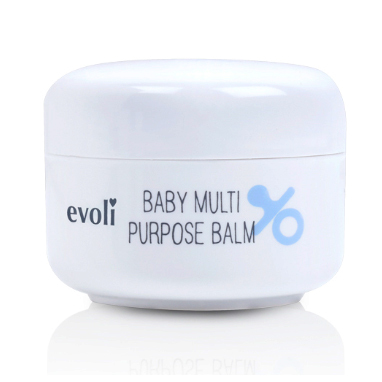 Evoli is an international company that creates baby skincare products and accessories. From lotions to body wash, their products are designed with babies in mind. One thing I really loved learning about Evoli is how passionate they are about providing the safest possible product for their clients. As mentioned earlier, having had four children with sensitive skin, my experience with all types of baby lotions and bath products is quite extensive. From top of the line lotions to doctor prescribed skincare treatments, it really can be difficult to narrow down what is right for your baby. The Welcome Newborn Set from Evoli came with everything I needed to provide safe and soothing skincare protection from day one. Upon arrival, the Welcome Newborn Set is perfect to hand deliver to a new or expectant mother. It comes as a keepsake memory box that can be used to keep the most loved memories protected. To insure that even the smallest strand of hair doesn’t get lost, each box comes with 15 Baby Keepsake Envelopes, along with stickers and labels to help organize and capture the memories of your baby. Along with the ability to use the box as a keepsake, inside are five essential skincare products that help keep skin soft, treat rashes, and help heal any minor abrasions. The foaming wash is one of my favorite items found in the Welcome Newborn Set. One pump of foaming wash goes a long way. 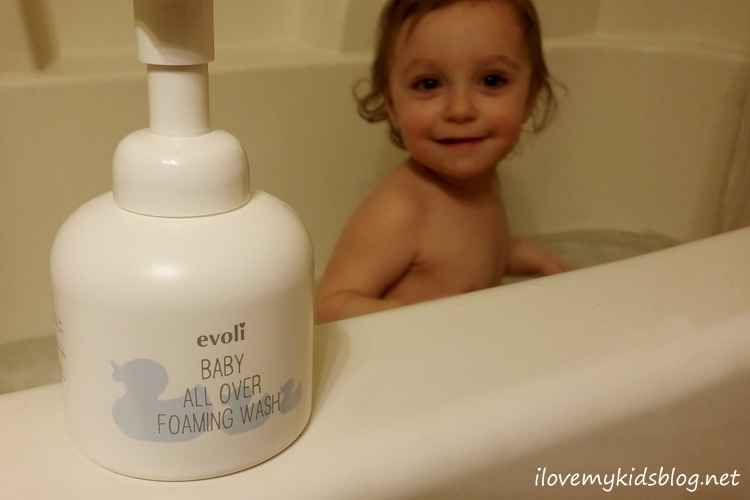 My daughter has very sensitive skin and typically gets rashes from using body wash. However, after using this body wash we did not experience any skin irritations. It is lightweight and safe for her body. She loves being washed with it. She is now 18 months and after using this product for about two months, I am still a believer. I love it. We use it not only on her body, but also to wash her hair as well. It keeps her skin moisturized and has helped her flakey scalp (also known as cradle cap) diminish. I love love LOVE this product. 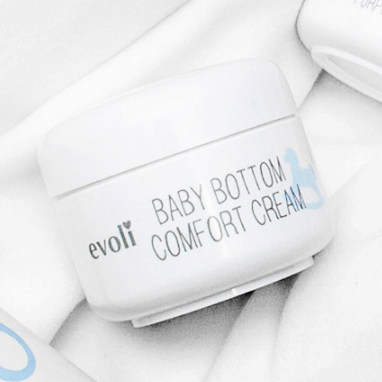 After browsing Evoli’s website to order more, it seems it is only available in the Welcome Newborn Set at this time. (Sad face) This cream has been one of the best body creams I have ever used on my children. Not only have I used it on my baby, but I also have used it on my older children who suffer from extreme dry skin and eczema. The cream is lightweight and leaves the skin feeling very soft. It is not greasy like most skin creams can be. I wish it was available for individual purchase. It is possible they are out of stock on it, making it unavailable for purchase right now…I am going to hope that it is the case, not only for me but for you also. The instant soothing gel has come in handy for use on my older children, but not so much for my baby just yet. The container is a perfect size to have in your diaper bag for easy accessibility. Best used for insect bites, minor scratches or burns, the instant soothing gel helps add instant comfort when applied. One of my older children got a deep paper cut on their hand, and I used the soothing gel to act as a quick comforting agent. It put a protective layer over the cut, and helped ease the uncomfortable feeling the paper cut had caused. Once the gel had absorbed into the skin, all was well. Now that I have this, I try not to leave the house without this in my diaper bag. Sensitive skin usually means extra sensitive bottoms. I was pleasantly surprised with the ability this product had to heal and moisturize a sore bottom. Diaper rashes are almost inevitable, and if your baby has sensitive skin, it becomes difficult to treat at times as well. The comfort cream is thick and non-greasy. It creates a great barrier allowing quick healing and comfort to your baby. The ingredients are a perfect combination for sensitive skin. It is quite possibly one of the best bottom creams I have used in all my years of parenting. This balm helps take care of a little bit of this and a little bit of that. It is safe to use all over the body, and helps the skin maintain moisture and have an oh so soft feeling to it. I use this often on my children when their lips are dry and chapped. It provides just enough moisture and protective elements that it helps heal damaged skin, from head to toe. The Welcome Newborn Set has everything you need to provide great skincare and comfort for any baby anywhere. Evoli is “I Love” backwards. 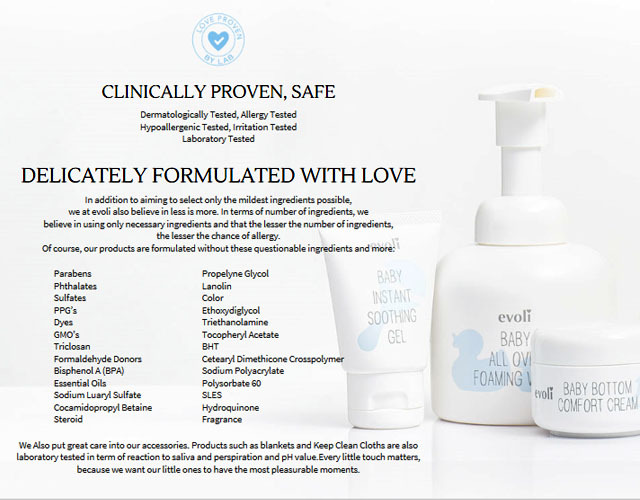 It is apparent, after using their products, that they truly do put love as the first focus of their business. I hope you love their products as much as I do.